Low Carb Chocolate Truffle Creme Brulee is rich, chocolaty and decadent! No one would believe that this dessert is low carb and low in sugar. It’s outstanding. Oh, BOY! 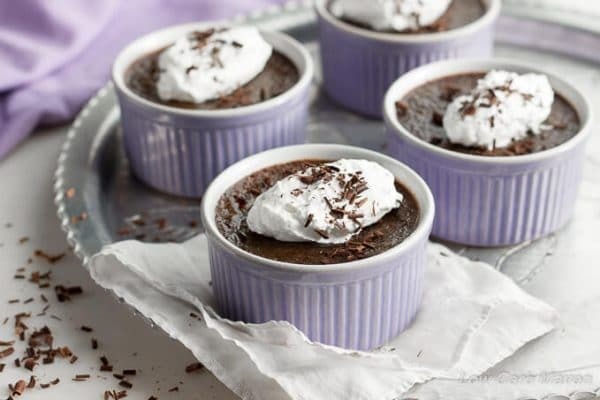 You’re going to love me for this Low Carb Chocolate Truffle Creme Brulee recipe. I think it’s the perfect dessert for Valentine’s Day. It’s rich and silky just like a chocolate truffle but in custard form. I have worked on 4 creme brulee recipes over the past few weeks, like the Sugar Free Coffee Creme Brulee I posted last week, and they’ve all been great. This recipe, however, is really special. As many of you know, I really love chocolate – evidenced by the number of low carb chocolate desserts I have on the blog. One of the most amazing desserts to date is the Low Carb Chocolate Truffle Cheesecake I posted in December which incorporates Sugar Free Chocolate Truffles flavored with brandy. It’s the recipe that inspired this low carb chocolate truffle crème brûlée. If you have never known the extreme pleasure of eating a good creme brulee, read below to discover what you are missing and how easy the dessert is to make. Creme brulee is a decadent creamy custard made of heavy cream, egg yolks, and sugar. After cooking and chilling, sugar is sprinkled over the custard and browned with the use of a culinary torch or by putting the dessert under the broiler. This contrasting layer of caramelized sugar (brulee meaning burnt) gives creme brulee a nice textural interest as well as adds to the overall flavor. Upon hearing the words creme brulee, one’s mind may evoke an image of a special dessert once enjoyed at a favorite fine dining establishment. Since our generation has somewhat lost the knowledge and ability to cook from scratch without the use of convenience items, desserts like creme brulee are surrounded by a bit of mystery. I’m happy to tell you that nothing is further than the truth! Low carb creme brulee is just as easy to make as regular creme brulee. In fact, I enjoy the low carb or sugar free versions more. Erythritol and stevia have become the standard low carb sugar alternatives for low carb recipe blogs nowadays. Because erythritol is not broken down by the body, calories are not absorbed and it doesn’t spike your blood sugar. Stevia is an extremely concentrated herbal sweetener often used to augment the sweetness of low carb sugar alternatives. Since low carb subs are expensive, reducing the amount in a recipe and adding stevia helps save money. The only difference in using many low carb sweeteners is that they cool upon melting so it may take a few minutes longer for certain things to cook. This Low Carb Chocolate Truffle Creme Brulee recipe is a little higher in carbs than other creme brulee recipes because of the chocolate. I used a good quality high cocoa dark chocolate which did have some sugar in it. I could have used sugar free Lily’s chocolate chips, but the total carbs were much higher and the net carbs the same. Because total carbs are important to watch in a low carb keto diet as well, I opted for Ghirardelli 90%. Because this dessert is very chocolatey and rich in flavor, it can be easily shared. My husband and I each shared a serving with our children, which was kinda nice. This allowed us to have dessert for two nights instead of one! Low Carb Chocolate Truffle Creme Brulee is 8 net carbs per serving but can easily be shared. 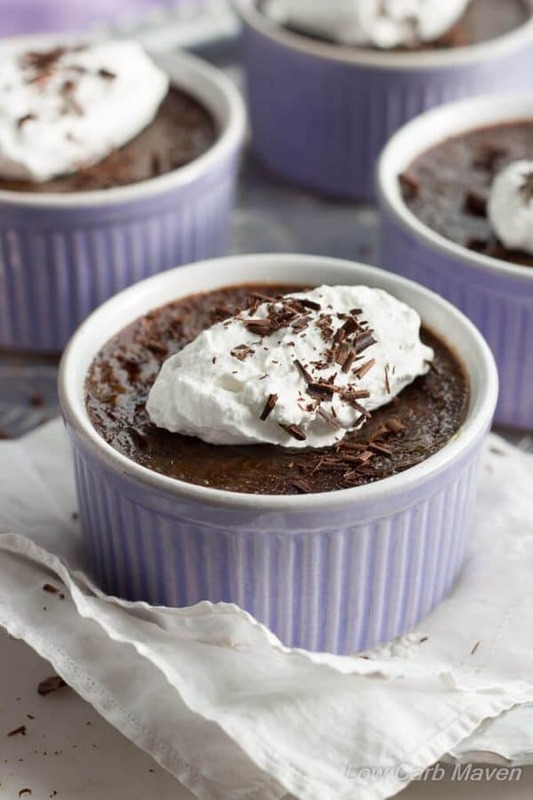 This low carb chocolate creme brulee is just as rich and creamy as a chocolate truffle. It's is the ultimate in low carb chocolate desserts. Its so rich, you may have to share! Preparation: Preheat oven to 350 degrees and place rack to the middle position. Heat water in a tea kettle until hot, not boiling. Find a pan large enough to fit the 4, 6-ounce ramekins and deep enough to add water half way up the sides of the ramekins. Chop the chocolate into slivers. Method: Add the yolks and 1 tbsp of the granulated sweetener to a medium bowl. Beat well to completely break up the yolks. Pour the heavy cream into a small pot and add the remaining granulated sweetener, and stevia glycerite. Place the pot over medium heat and heat, stirring occasionally with a whisk, until bubbles begin to simmer around the edge of the pot. Turn off the heat and begin pouring the egg yolk into the hot cream mixture - very slowly in a thin stream, while quickly whisking all the while. Add the chopped chocolate and stir to melt and combine. Whisk in the brandy. 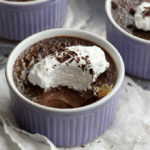 Bake: Divide the chocolate truffle creme brulee mixture evenly between 4 ramekins. Place the ramekins into the pan and fill the pan with hot water half way up the sides of the ramekins. Carefully place the pan into the oven and bake for 30 minutes or until the very center of the creme brulee is barely jiggly - about the size of a nickle or a dime. Cool the chocolate truffle creme brulee in the water bath for an hour before removing to a rack to cool completely. Cover with plastic wrap and refrigerate at least 4 hours but overnight is better. Before serving, sprinkle 1/2 teaspoon of Lakanto Monkfruit Sweetener or Swerve Granulated over the top of each creme brulee. Melt the sweetener with a culinary torch until it caramelizes, turning brown. Alternately, add a dollop of whipped cream to the top. Serve. Kim, this recipe is out of this world delicious! So creamy, so rich, so chocolatey!!! I used Lindt 90%. We actually preferred topping it with Chantilly Cream (whipping cream, vanilla, stevia) rather than the classic sweetener “brûlée” which was a little too sweet… but wow! This is a keeper for the recipe book!!! Thank you ever so much for this one!!! Why one less egg yolk in the chocolate one than in the vanilla creme brûlée? Wowza! I made it last night, substituting on-hand ingredients – Lily’s Extra Dark Chocolate and Grand Marnier – and it was absolutely delicious, with no after-taste. I made a test cup, and tasted it before it was completely cooled with some whipped cream, and was bowled over! Tonight I will torch the sweetener on top, for my birthday! Thank you – well done! Do you think this would work if I subbed in coconut milk for the cream. I’d use NF Simple, which while full-fat, is usually liquidy and not solid like most. This is my all-time favourite low-sugar dessert! We make a bun recipe that calls for egg whites only, and I make this EVERY SINGLE TIME (which means we pretty much eat this weekly :P). It’s obscenely good. Thank you so much! Can the stevia glycerite be omitted and adjust the swerve to taste? Also can the Brandy be deleted? if so do any adjustments need to be made? Kim – this sounds wonderful! How would you adjust the time for 6oz ramekins? Well if you made 4 desserts using 10oz ramekins I figure I could make make 8 desserts putting 5oz of the mixture in 6oz ramekins. How long do you think I should cook them for? I cannot wait to make this. Looks amazing and know it will taste even better. Love your recipes! Had some leftover eggyolks so tried this recipe. Brulee is so easy and delicious. Love you so much right now! Thank you! Kim: the nutrition analysis… is that 10 carbs per serving or in total? I do Keto, so that 10 per serving is a little scary for me. Wondering if I could find alternatives to lower carbs (Lily’s chocolate, for example). Where are all the carbs coming from? ? Hi! I featured this recipe in my post 15 Low Carb Desserts that are Absolutely Delicious! oh my gosh!! Can I do this in the Instant Pot??!! I need to try!! Arlene – did you ever make this in your IP? How did it turn out? How long did you cook it for? Could I replace the cream with full at canned coconut milk? What can I use as a substitute for the heavy/whipping cream? Also, can I omit the brandy? Also, what can I use as a stevia glycerite substitute? Can I use granulated Splenda? What size ramekins do you use??? Hey Kim – Just an FYI – this is the post I was referring to where you said the ramekins you used were 10oz. I’m sorry but I’m confused on the directions for the sweeteners – it’s 1/3 cup of Sukrin and how much of the Monk or Swerve? I haven’t tried Sukrin before – is there a substitute? I’m still confused. What do you mean by the 1/3 sukrin :1 ? Does this mean that the concentration of 1/3 cup sukrin is equivalent to 1 cup sugar? By the way, I am new to your site and I’m so glad I found you! Your site has become my new favorite place to look for new LCHF recipes. Kim, these are beautiful!!!! They look so rich and decadent! Bonus that it is guilt less! Yum! Did you use canned coconut cream? Did it work? What is stevia glycerite ? I haver never heard of it in Australia? This looks amazing… I cant WAIT to try it!! If I don’t have Brandy, could I just leave it out, or should I replace it with something? Also, I don’t have any stevia glycerite, but I have liquid extract. Could I use that instead? If so, do you know how much I would use? Creme brulee is one of my favorite desserts, I make it rarely because it is so rich and everything, but when I do it is a total delight. I have never had a chocolate version though, not to mention low carb. It sounds and looks delicious! Oops. Thanks. I copied the instructions ruins. I will fix! …wow. This recipe is simply the best! Both my 6 yr old son and husband have declared this the winning flavor (compared to plain and coffee)! They each ate two servings before I could stash them away!!! Me? I’m torn between the coffee and chocolate truffle, so I won’t pick one……I’ll just keep making them both. ? The best part is that neither the coffee nor the chocolate truffle one is too sweet (I skipped the stevia because it always comes through too sweet for me). Thank you so much for sharing this wonderful creation! Oh wow, I’ve never had chocolate Creme Brulee before. My favorite flaming kitchen tool has another fun project in store. Chocolate is the perfect excuse to play with the kitchen torch. Wow this looks SO good – fantastic! This looks like heaven! Will definitely be making this soon! You are correct – I do love you for this recipe! It looks so rich and velvety smooth! Perfect for Valentine’s Day! Nice!, I don’t mind getting rid of the sugar either and am happy to do it for this recipe, love the low carb too of course, and better yet, the brandy, thank you for this recipe! WOW! This creme brûlée looks incredible! 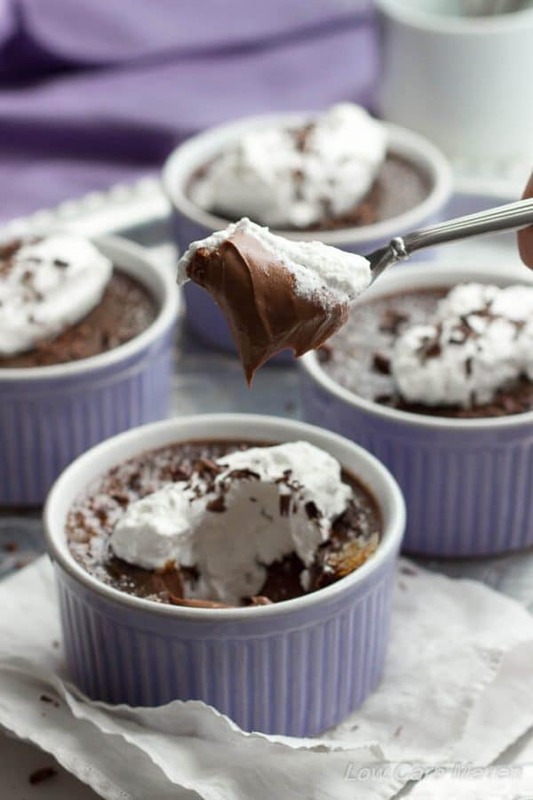 I love creme brulee and I love chocolate, hence this is the most perfect dessert ever created! I’m literally drooling! ? Can’t wait to try this! I will report back.